“The heavy today is usually not my kind of guy. In the old days, Rory Calhoun was the hero because he was the hero and I was the heavy because I was the heavy—and nobody cared what my problem was. And I didn’t either. I robbed the bank because I wanted the money. I’ve played all kinds of weirdoes but I’ve never done the quiet, sick type. I never had a problem—other than the fact I was just bad.” In his own words Jack Elam, the man with the off-kilter eye, described the type of heavy that made him one of the top five screen heavies in a career that spanned nearly 50 years with his rich repertoire of badmen, scoundrels, gangsters and loveable bumblers. Even an occasional hero. 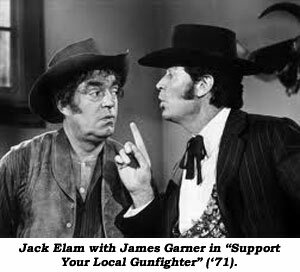 Jack Elam was born November 13, 1920, in Miami, Arizona, a tiny mining community 100 miles from Phoenix, then grew up in Phoenix. His mother died when Jack was about two and he lived with various families who made him earn at least part of his keep. He remembered picking cotton at six. When Jack was nine he was reunited with his father, a building and loan appraiser who suffered from a serious eye ailment which made it difficult for him to work. He had Jack fill out forms for him at night. When Jack was 12, he, himself, suffered the loss of vision in his left eye when he was involved in a fight at a Boy Scout meeting and was jabbed in the eye with a pencil by another boy. Elam had no control over his wandering eye, “It does whatever the hell it wants,” Jack laughed. But the handicap became an asset when he later turned to movie work. His eyes conveyed villainy as surely as Durante’s nose suggested humor,” Doug Martin wrote. “One eye squinted and the other was open. One pointed one way and the other another. It all seemed malevolent.” As he changed from thugs to humorous characters, so followed the eye to comic situations. After high school, Jack moved to California and attended Santa Monica Junior College and Modesto Junior College where he met his future wife, Jean Hodgert. Married in 1937, they had two children, Scott and Jeri. Jack had a third child, Jacqueline, with his second wife, Margaret (Jenny) Jennison whom he married in 1961 after his first wife passed away. Exempt from WWII military service because of his eye, Jack worked as a civilian for the Navy in Culver City. During his 20s and early 30s, Jack took a position as both auditor and manager of the famed Bel Air Hotel. When the Bel Air sold, Jack proved himself to be a ‘Jack of all Trades’ working as an accountant, purchasing agent, business manager and controller at Hopalong Cassidy Productions. Working as an auditor looking at numbers put a strain on Jack’s good eye. His eye doctor told him to find a new line of work. Because of his contacts in the picture business, he was able to help establish financing for three films (two of which were “High Lonesome” and “The Sundowners”, both ‘50) in exchange for a small role in each. 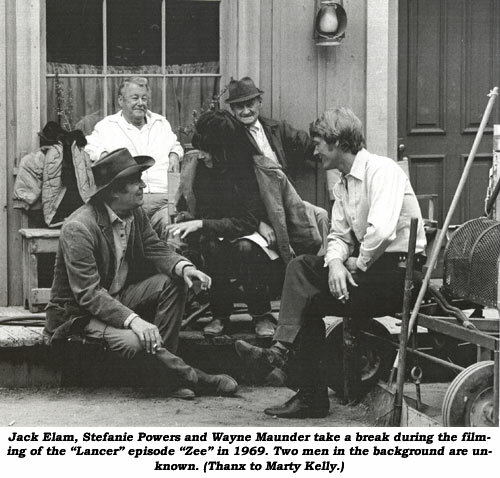 Jack’s big break came in 1949 filming “Rawhide” for director Henry Hathaway. With strong encouragement from star Tyrone Power, Jack played one of the nastiest, most sadistic villains ever on the screen. Power urged Darryl Zanuck to put Elam under contract, which resulted in a seven year contract at 20th Century Fox. Jack was off and running and never stopped being in huge demand until his last film (“Bonanza: Under Attack” for TV) in ‘95…119 movies and 260 television appearances. 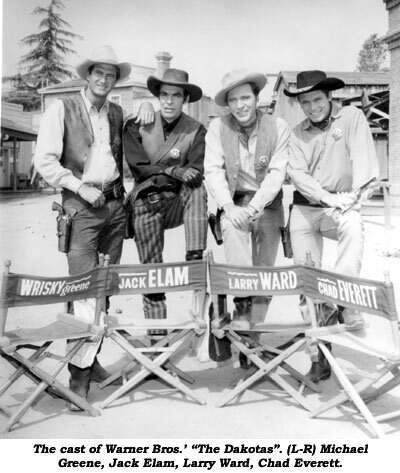 Jack’s career falls into three phases—in the ‘50s and ‘60s he was the meanest of screen heavies, that is, with the exception of being on the right side of the law as reformed gunfighter, J. D. Smith, deputy to Marshal Frank Ragan (Larry Ward) for 19 episodes of Warner Bros.’ “The Dakotas” in ‘63. When that series failed, WB put Jack into “Temple Houston” (‘63-‘64) as Jeffrey Hunter’s sidekick, George Taggart, another reformed gunfighter. 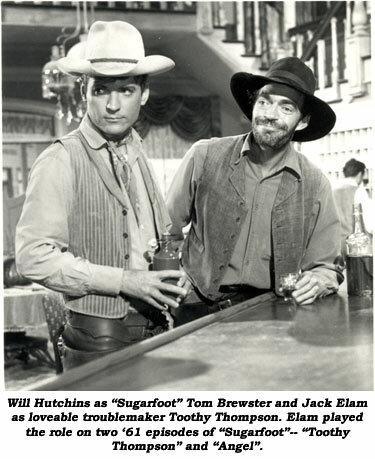 When, as Elam put it, “I grew too old and too fat to jump on a horse,” he grew a long beard and settled into loveable old coot characterizations on “Father Murphy”, “Alias Smith and Jones”, “Paradise” and in “Hawken’s Breed” (‘87), “Big Bad John” (‘90), “Once Upon a Texas Train” (‘88) and “Lucky Luke” (‘95). Pinned down as to his favorite film, it’s “Support Your Local Gunfighter”. King Vidor and Burt Kennedy were directors Elam admired. His work in “Ransom of Red Chief” led to a 1977 daytime Emmy nomination. In 1983 Jack received the Golden Boot Award and in 1994 he was inducted into the Cowboy Hall of Fame in Oklahoma City. “I drank scotch and played poker.” That’s what Jack Elam always said he wanted on his tombstone. Jack died at 82, October 20, 2003, of congestive heart failure at his home in Ashland, Oregon, where he’d lived since 1990.